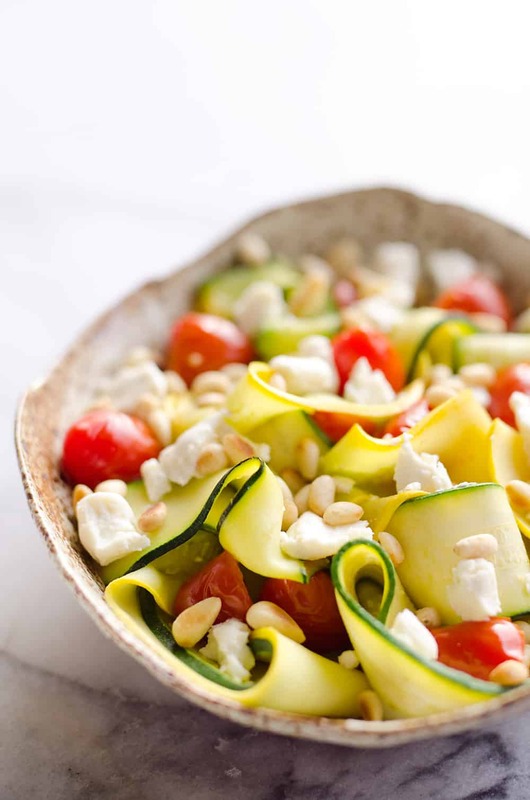 Ribboned Squash & Zucchini Salad is a fresh and healthy vegetarian salad with light veggies, toasted pine nuts, creamy goat cheese and balsamic glaze. 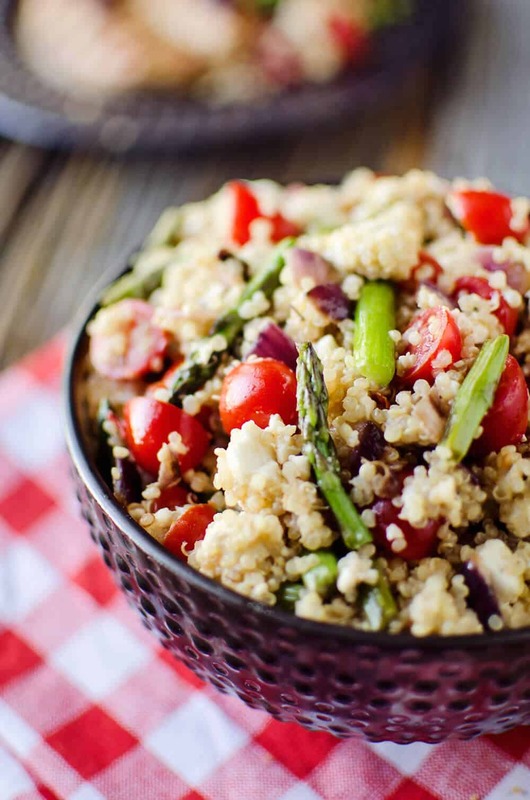 Pair it with some grilled shrimp or chicken for an amazing and flavorful dinner you won’t forget! 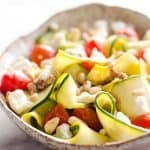 This Ribboned Squash & Zucchini Salad is such a fresh and beautiful salad, I just can’t get enough of it! 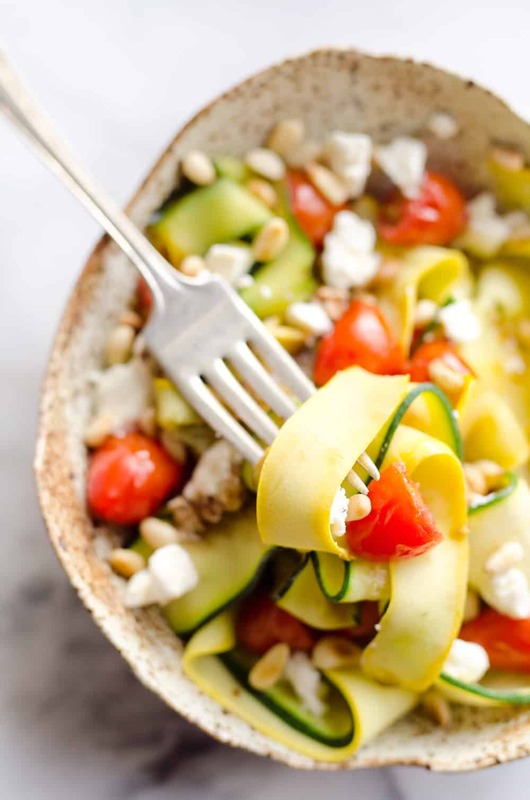 From the lightly sauteed zuchini and squash to the toasted pine nuts and creamy goat cheese, it takes a basic vegetable salad to a whole different level. A drizzle of thick balsamic reduction is the finishing touch that really puts it over the top! Did you all have an amazing 4th of July celebration? Mine was pretty low key in the world of holiday weekends. I spent the morning bumming around the house and packing for our cabin vacation, then I headed out golfing with my dad and sweated my balls off. It was hot and extra humid, but there was at least a light breeze to make it bearable. When I got home in the evening I got straight to work finishing up packing and cooking. I baked two pans of bars for a softball fundraiser our team is hosting. I made a simple pan of blonde brownies as well as one of my favorites, these Peanut Butter & Chocolate Dream Bars. They are so insanely good and easy to make, they are an absolute must try. It made me a whole lot of sad that I was making these and wouldn’t even get to enjoy a single bite of them! After the bars were done I got to work prepping food for my meals at the cabin. My mom and I tend to bear the bulk of the burden when it comes to providing and preparing food during family get-togethers, so for this vacation I decided to put the hammer down. I started a Google spreadsheet with all the meals we would need for the five days were were staying there. Each family had to sign up for at least 2 meals to make things a bit more fair. 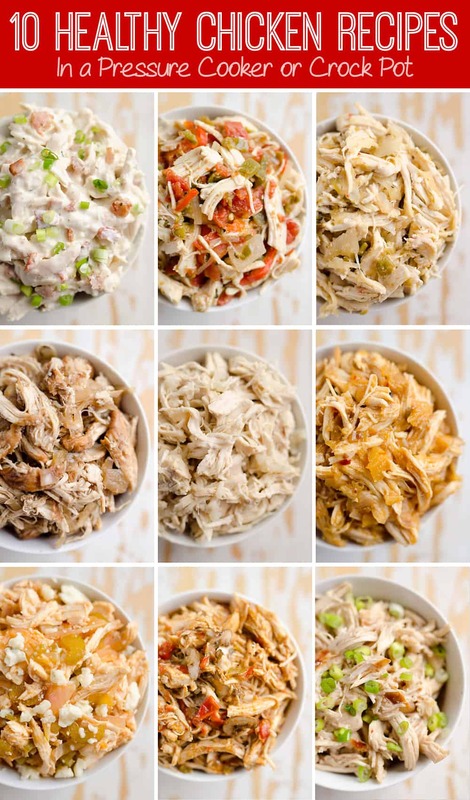 I am making this Light Ranch BLT Chicken Salad for a lunch and burgers with caramelized onions and Havarti for a dinner. I also decided to add a dessert to the mix, so I am making this super easy Light Berry Angel Food Cake for a fresh treat and then I prepared a double batch of Cranberry Almond Energy Bites for a wholesome snacking option. 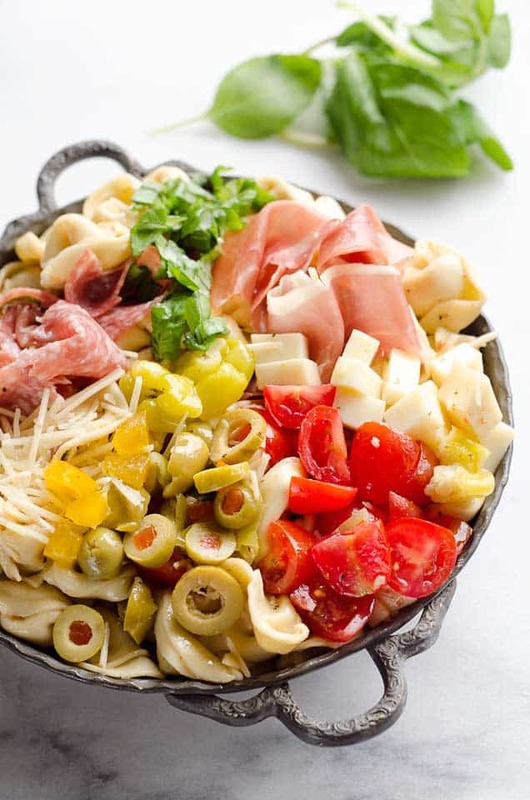 I am such an oinker, because the thing I am most excited for this vacation is basically all the good food I will get to enjoy! My mom is making sauerkraut and dumplings which I haven’t had in years and my sister is making Taco Pie which is a family favorite. So much goodness! 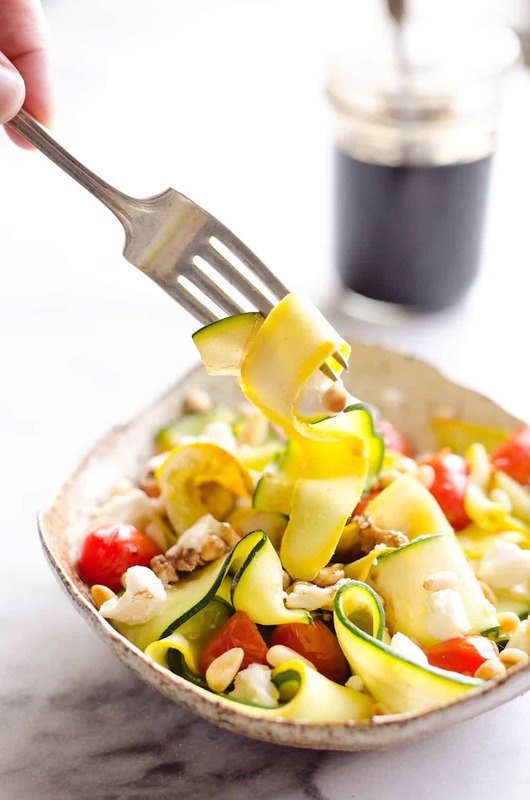 I will definitely be needing to make lighter dishes like this Ribboned Squash & Zucchini Salad when I get home from vacation to balance things out! 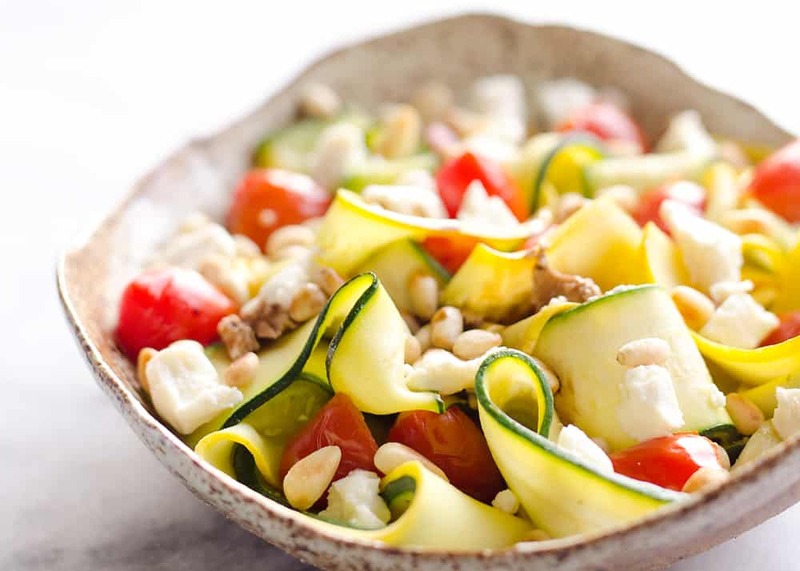 Ribboned Squash & Zucchini Salad is a fresh and healthy vegetarian salad with light veggies, toasted pine nuts, creamy goat cheese and balsamic glaze. 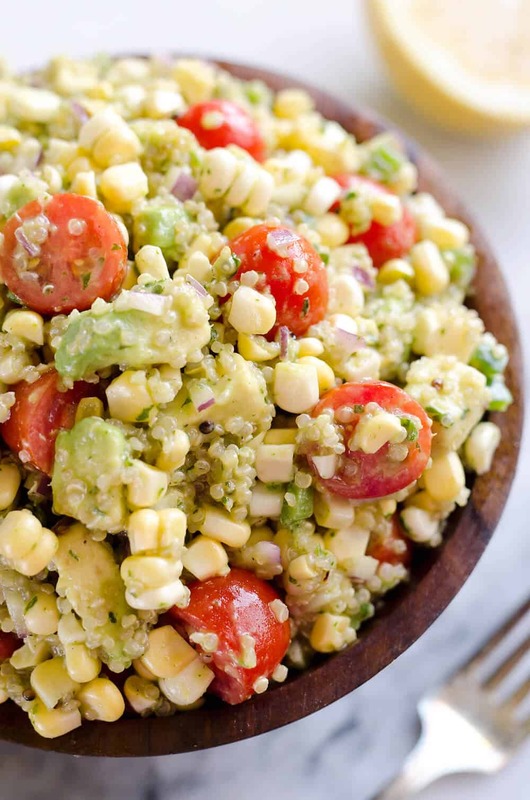 Pair it with some grilled shrimp or chicken for an amazing and flavorful dinner you won't forget! 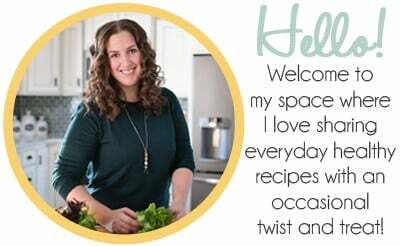 Cut the ends off of the zucchini and squash and using a peeler, ribbon the vegetables. In a large skillet over medium heat, toast the pine nuts for 3-5 minutes or until golden brown. Remove the nuts from the pan and set aside. 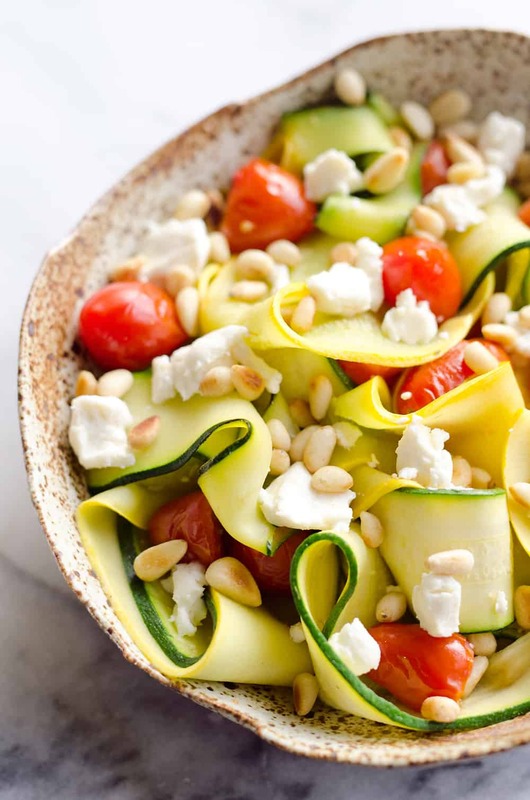 To that same pan, add 1 tsp of olive oil, the zucchini and squash ribbons, tomatoes and garlic salt. Saute for 2-3 minutes, just until lightly cooked through. 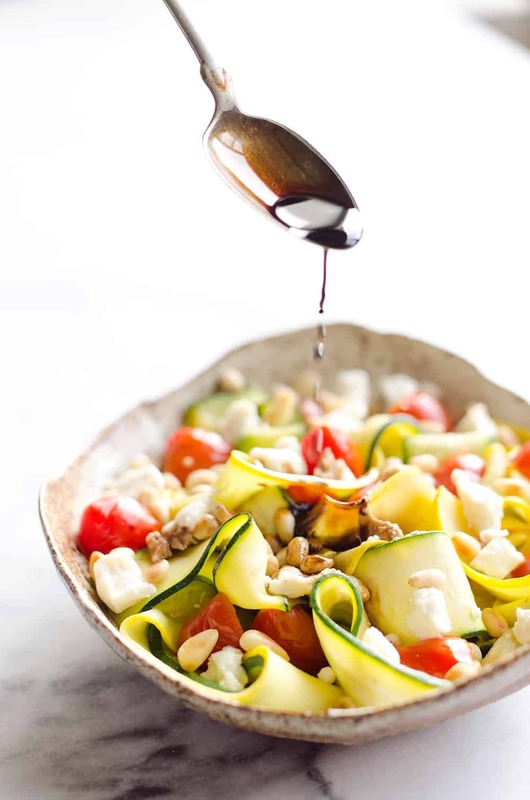 Toss the vegetables with the pine nuts, goat cheese and drizzle with the balsamic reduction. Serve immediately.